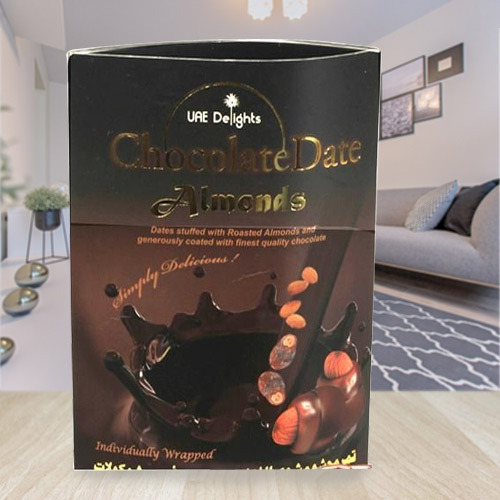 Make this wonderful season glorious with this Lip-Smacking Array of Chocolate Wrapped Date-Almond and create a space in the heart of your dear ones. This canister is packed with world's finest Dates combined with Roasted Almonds and elite quality Chocolate. Flowers Delivery Mirzapur, Send sweets Kurukshetra, Wedding Cake Dholpur, Diwali Mithai Tiruchirapalli, Send Flowers and Gifts to Ooty, Online Shop Sambhalpur, Flower to Proddutur, New Year Flowers Jhansi , Fresh Fruits Bombay, Send Gift Ankleshwar, Dry Fruits to Kottakkal, Birthday Delivery Kolhapur, Sending to Nadiad, Flower shop Karauli, Churu Online Cake Delivery.